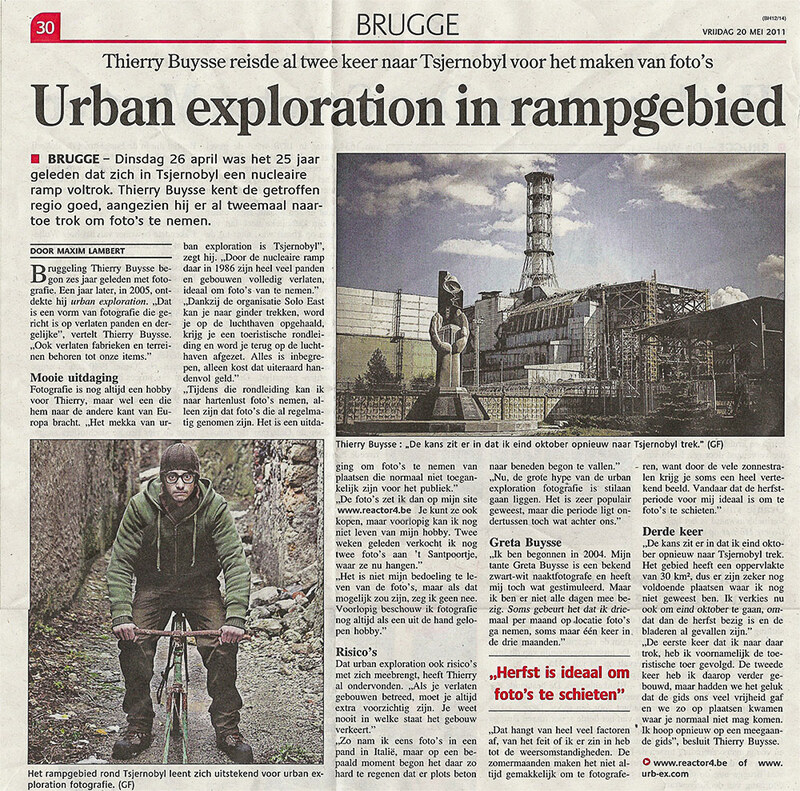 - 10.02.2006, newspaper article about me and urban exploration in a the newspaper (BHB). You can read the article here. 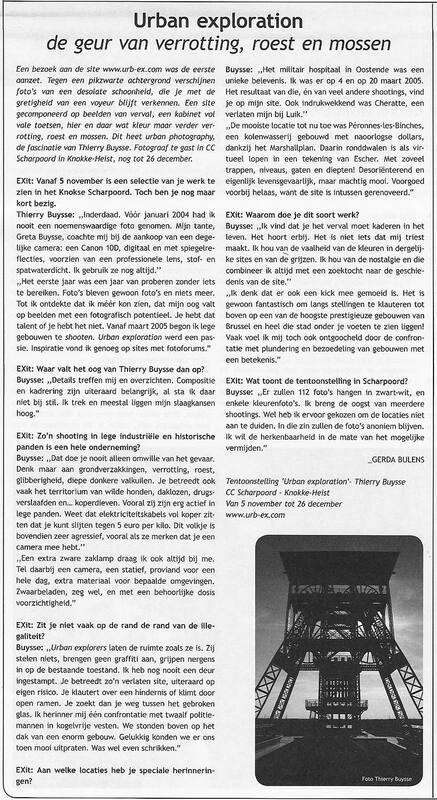 - 19.05.2006, newspaper article about my first prize in a European photo contest (BHB). You can read the article here. 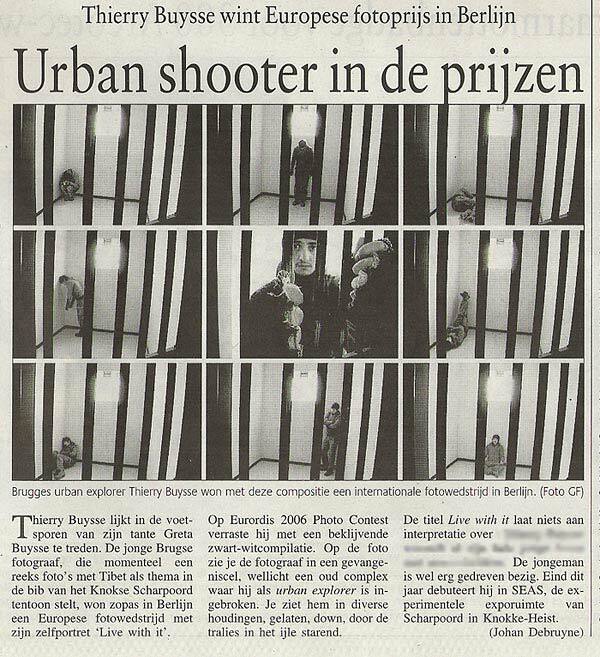 - 27.10.2006, newspaper article about my first Urban Exploration Exposition (Exit). You can read the article here. 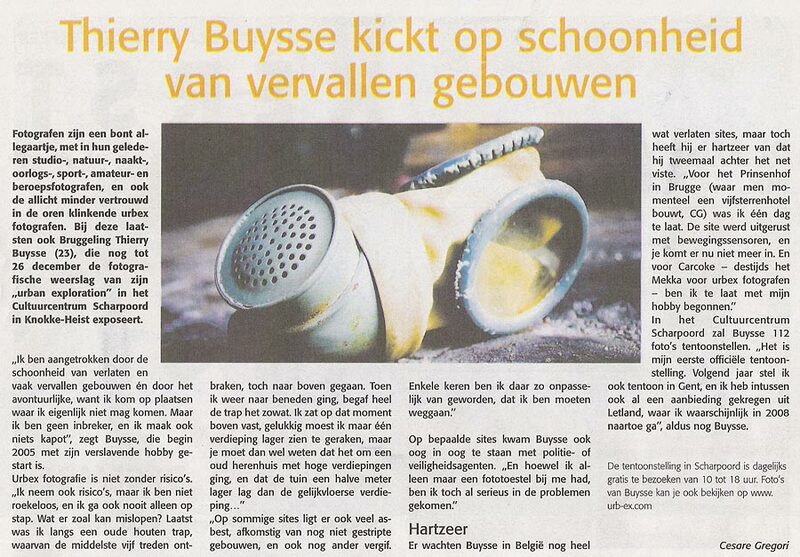 - 10.11.2006, newspaper article about my first Urban Exploration Exposition (BHB). You can read the article here. - 24.11.2006, newspaper article about my first Urban Exploration Exposition (PAU) You can read the article here. - 06.04.2007, newspaper article about my third Urban Exploration Exposition (BHB) You can read the article here. 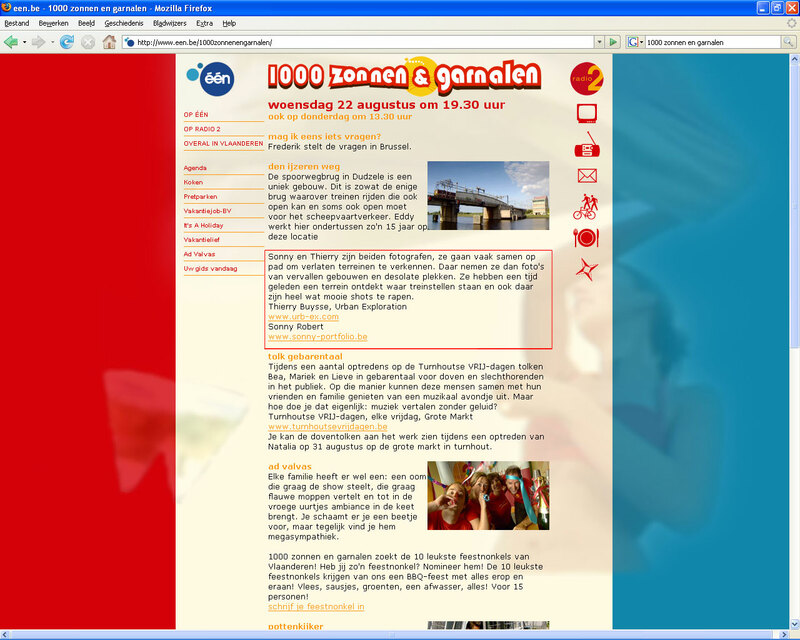 - 22.08.2007, tv-reportage in "1000 zonnen en garnalen" (1000 suns & shrimps) about me and Sonny, here is the announcement. - 18.01.2009, newspaper article about me in a German Sunday edition of "Die Rheinpfalz". Download the PDF-file. - 01.07.2009, a full page article in "Columbus" (nr. 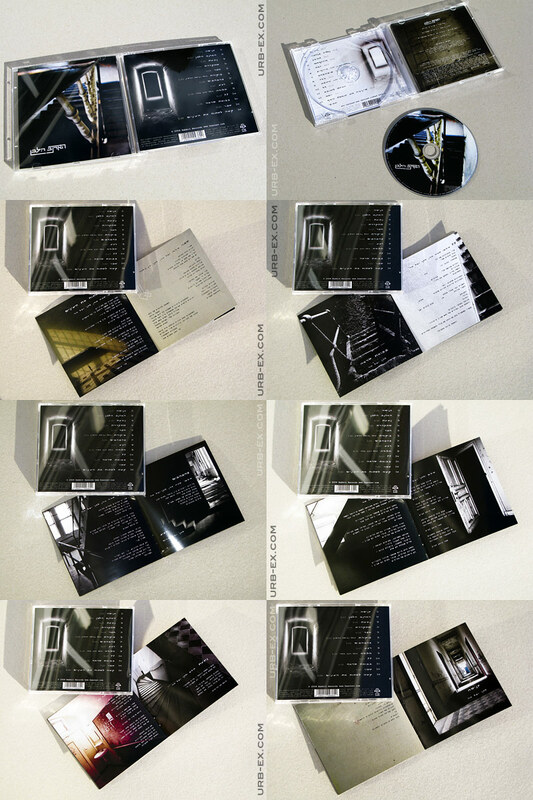 18 - summer 2009 - collectors edition). 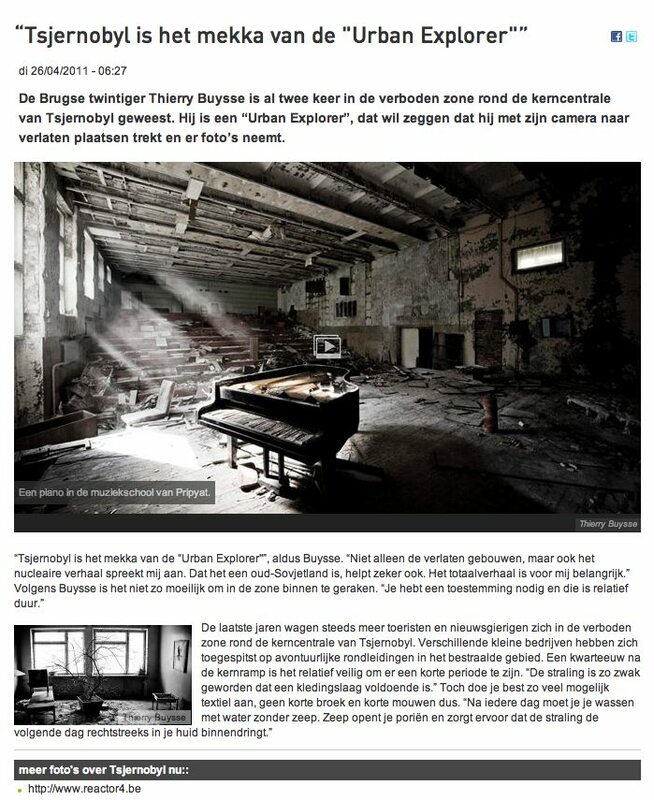 - 26.04.2011, a small article + photoslideshow were published at deredactie.be, the biggest press website of Belgium. Click here. - 26.04.2011, a 4:08 min. broadcast on StuBru (popular radio station). Click here to listen (mp3/dutch language). - 26.04.2011, a small article + a few photo's were published on the StuBru website due to an radio interview. Click here. - 20.05.2011, 3/4th of a page about my trips to Chernobyl (BHB). You can read the article here. - 01.12.2011, 8 pages with 4 pictures (2p/pix) published in L'Europeo, Italian magazine. You can see it here. 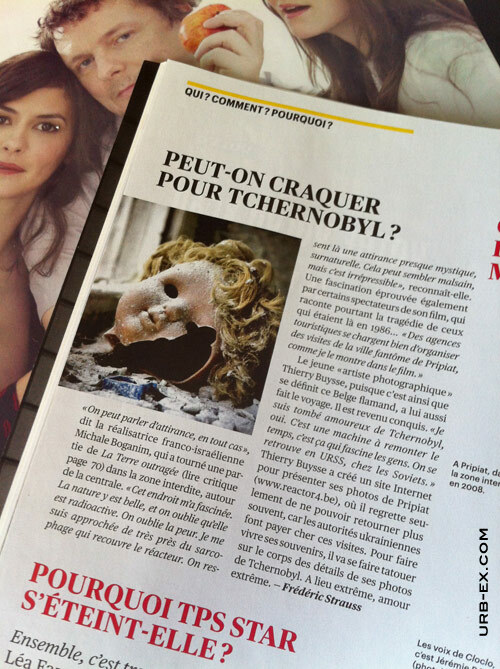 - 31.03.2012, small article with photo in Télérama, French magazine. You can read the article here . 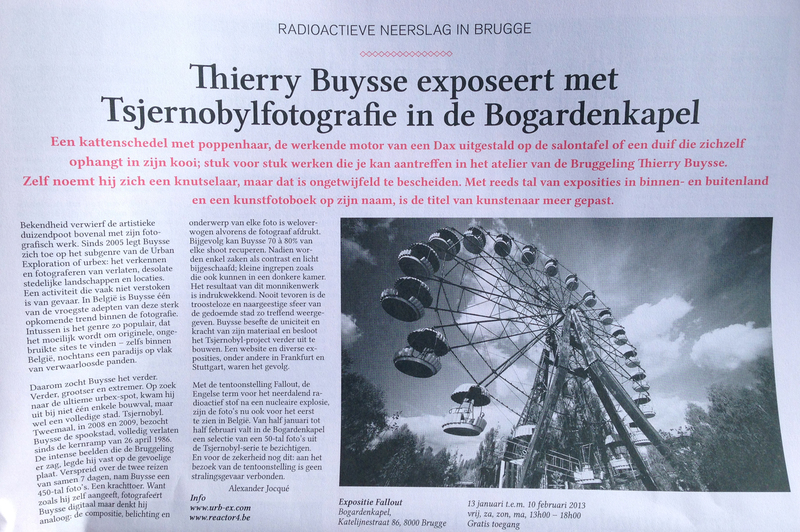 - 01.01.2013, half page article with photo in Exit about my upcomming exposition. You can read the article here . 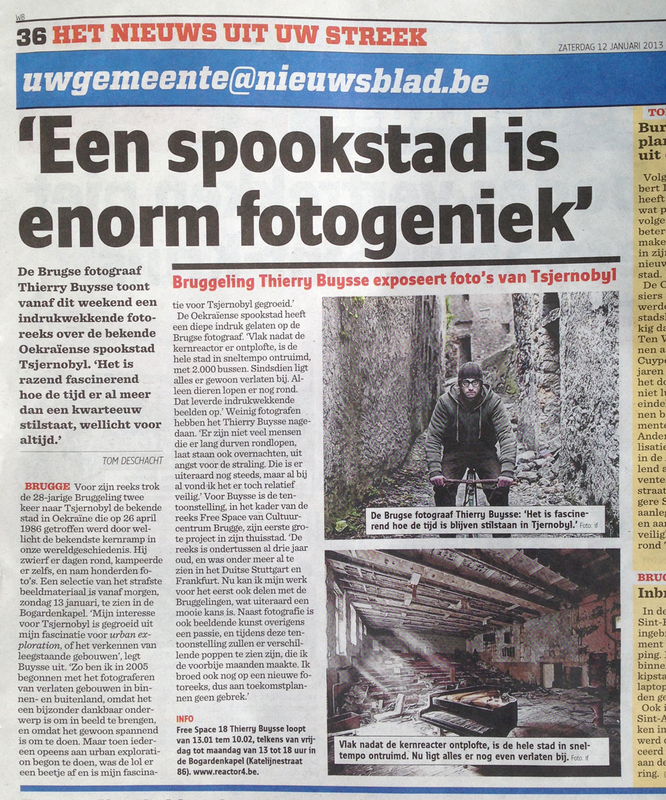 - 12.01.2013, half page article with photo in "Het Nieuwsblad" about my upcomming exposition. You can read the article here . - This photo has won the 1st prize in the category "Selfportrait" at a european photocontest, exposed on a temporary expositon in Berlin (Germany) in May 2006. - An exposition with my photo's of the Tibetan monks and Mandala's from 12 May till 13 June 2006 in Knokke (Belgium). - *urb-ex.com* 2006 - from 5 November till 26 December in Knokke (Belgium). Photos here. - *urb-ex.com* 2007 - from 15 February till 11 March in Gent (Belgium). Photos here. - *urb-ex.com* 2007 - from 29 March till 16 May in Brugge (Belgium). - *urb-ex.com* 2008 - from 22-24 August in Heule, Kortrijk (Belgium). - *urb-ex.com* 2009 - from 3-11 October in Poeke, Aalter (Belgium). - *reactor4.be* 2010 - from 9 May till 30 June in Stuttgart (Germany). - *reactor4.be* 2011 - from 6 till 29 May in Frankfurt (Germany). - *reactor4.be* 2011 - 11-18-25 September in Maria-Aalter (Belgium). - *reactor4.be* 2011 - 1-9 October in Poeke, Aalter (Belgium). - *reactor4.be* 2013 - 13/01-10/02, Fallout CC Brugge (Belgium). - Title: Chernobyl Surfing – report from the “exclusion zone” 25 years later. 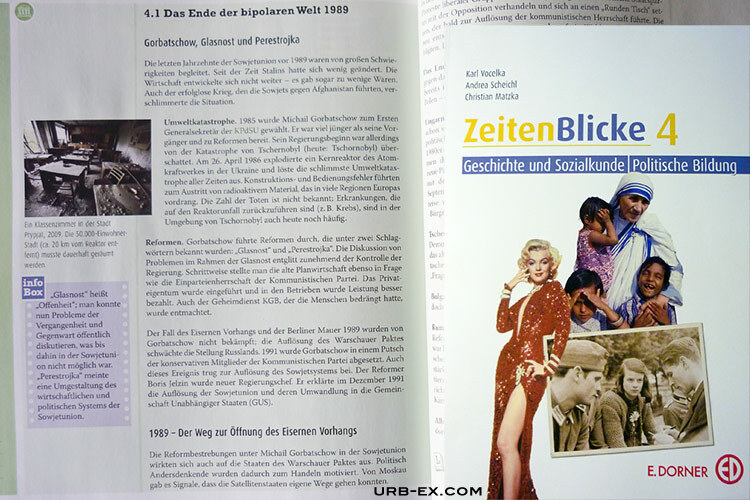 - A picture of a classroom in Pripyat (Chernobyl) has been used in a schoolbook called Zeitenblicke 4 to teach Austrian kids about Sovjet times and stuff (5000 copy's).